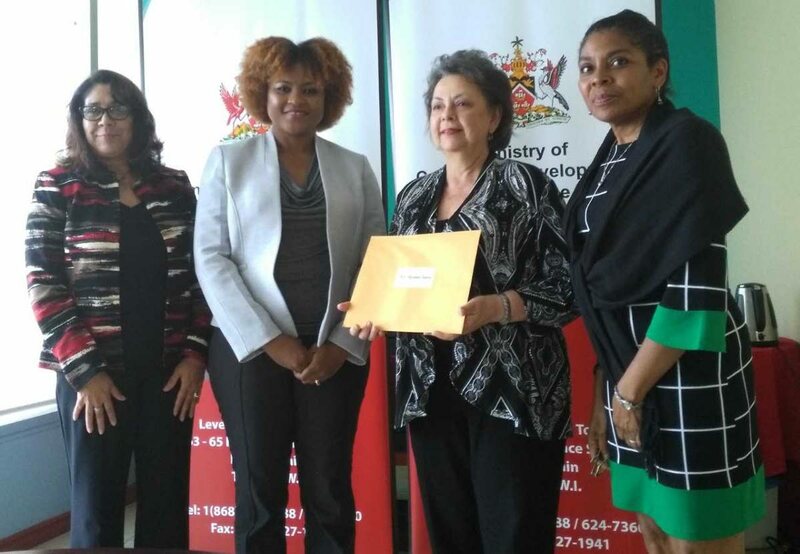 ON BOARD: Mas woman Rosalind Gabriel (third from left) receives her letter of appointment to the NCC board from Culture Minister Dr Nyan Gadsby-Dolly (second from left). Also in photo are permanent secretary Angela Edwards (left) and deputy permanent secretary Susan Shurland. WHILE veteran mas bandleader Rosalind Gabriel expressed elation with her new appointment to the board of the National Carnival Commission (NCC), president of the National Carnival Bands Association (NCBA), David Lopez, said yesterday her appointment will be challenged. In 2015, Minister of the Arts and Multiculturalism, Dr. Lincoln Douglas, fired Lopez from the NCC board but the court squashed the decision and Lopez was reinstated. When a new board was named in November 2016 by current Minister of Community Development, Culture and the Arts Dr Nyan Gadsby-Dolly, Lopez, together with the representatives of the other Carnival special interest groups, Keith Diaz of Pan Trinbago and Lutalo Masimba of the Trinbago Unified Calypsonians Organisation were reappointed. However Gabriel, president of the TT Carnival Bands Association (TTCBA), had filed for judicial review against the minister in March 2017 on the ground that she had no right to make any short-term appointments. But in January this year, Justice Joan Charles ruled that the minister acted lawfully to maintain the status quo. The TTCBA appealed that ruling, while the NCBA joined in the cross appeal as the affected party. That appeal is yet to come up for hearing. The judge had also ordered, at the time, that the count of bands to see which association was most representative of bands should be done. On June 21, Gadsby-Dolly presented Gabriel with her letter of appointment at the ministry at Level 20, Nicholas Tower, Independence Square, Port of Spain. “TTCBA has been fighting for recognition for quite some time and after a long process that took six years, this came about,” Gabriel said. The third entity that represents mas bands is the National Carnival Development Foundation. Reply to "Gabriel elated with new NCC post, NCBA to challenge it"